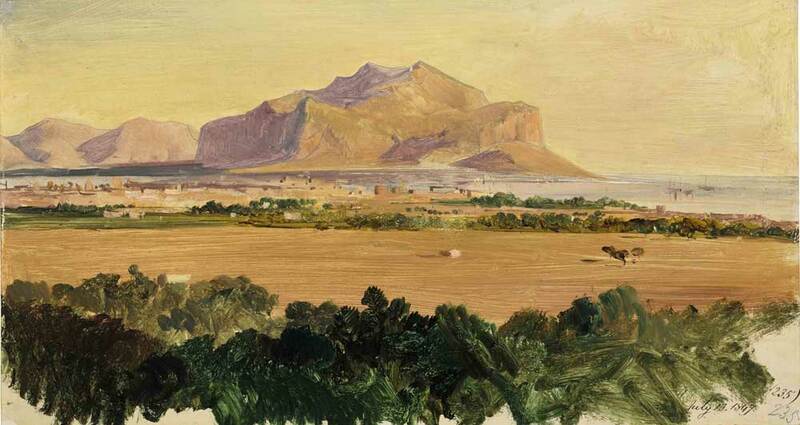 View of Monte Pellegrino, Palermo, 1847. Dated ‘July 13, 1847’ and further inscribed ‘(235)’ twice (lower right) . pencil and oil on paper, laid down on board. 8½ x 15¼ in. (21.6 x 40 cm.). Lear visited Sicily for the first time in 1842. This oil sketch was done during his second trip to the island in 1847, perhaps unusually, in situ. Lear typically sketched out-of-doors and then finished his oils in his studio. In this case, the seemingly rapidly executed brushstrokes on a sheet of paper laid down on board suggests that he made this oil sketch outside of Palermo. Monte Pellegrino is located on the Bay of Palermo and is home to the sanctuary of Saint Rosalia, the patron saint of the city. The numbering ‘235’ is Lear’s own numbering of his works. Every time he entered a new country, he would start numbering his sketches beginning at ‘1’.